I apologize for talking yet again about hreflang — but there is an important point I really want to make for those working in geo-targeting. For some, “hreflang” is becoming an auto-reflex, and that’s definitely not helping their international success. Allow me to explain why. A quick recap of hreflang first. Hreflang is an attribute which can be added to a link element in a page head, an HTTP header or an XML sitemap to indicate a geographic or linguistic preference for a URL; thus, enabling search engines to serve the correct page to searchers based on their language or location. Currently, both Google and Yandex support hreflang. Sounds great, doesn’t it? In many ways it is — but that doesn’t necessarily mean it’s always the answer. Let’s say you have a basic blog, and you want to target English speakers in the US, the UK and South Africa. You create the same content, but with slight regional variations for each country. In this case, hreflang is a great solution for ensuring that the proper version of your content is served to the proper user. Because of the blog’s small size, implementation is fairly manageable, and the impact on cost and coding is relatively small. If you’re operating in 40 languages and 200 countries, however, then deploying hreflang can be a very big deal. Thus, the first reason why hreflang should not be an auto-reflex is because the size and scale of the site may make implementation unmanageable. 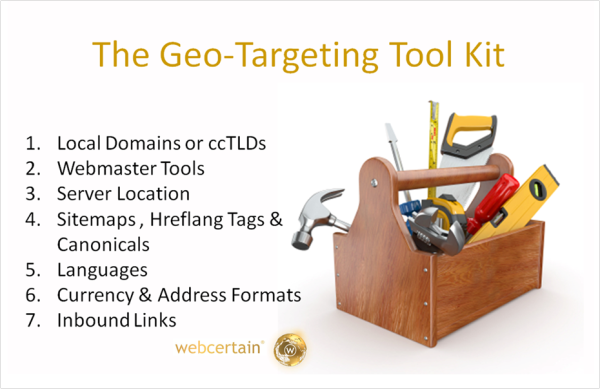 In these circumstances, other techniques should be used for geo-targeting the site, or a more limited roll-out should be adopted for critical areas or categories. Google launched hreflang in order to fix a specific set of problems which were causing difficulties with global and international sites. But, this doesn’t mean that Google previously had no way of determining which region a particular site or page was targeted to. Google could not have progressed to become the leading global search engine by neglecting this point! If you launch a multinational site today and implement hreflang from the get-go, then you might never know whether the rest of your site’s geo-targeting is working correctly. Why does this matter? If my geo-targeting is working correctly, then who cares why… right? In fact, you need to consider that hreflang is actually only one signal in the myriad of geographic signals which Google uses. Consider what might happen if one of your signals conflicts with another one. Which is most important, for instance — the language which actually appears on a page, or the language indicated by the hreflang attribute? Let’s imagine you have a page in Hungarian, but for some reason the hreflang tags pointing to it all say it’s German — what would you expect Google to do? Most probably, they’ll ignore the hreflang because their language detection technology gives them a very clear signal that the language is Hungarian. The point is, it’s much better to try to get all your other geo-targeting ducks in a row first and then deploy hreflang as a fix where needed — not the other way around. When it comes to conversion optimisation, the factors involved will vary significantly from one business to another. However, the key point here is that hreflang allows webmasters to get by with the site they inherit, rather than making the changes that would best suit customers. For instance, many marketers believe that ccTLDs (e.g., www.site.de) generate better conversion rates with international customers than more generic domains (e.g., www.site.com/de). But, hreflang makes it possible to ignore this factor and to instead use alternate methods that are less attractive to customers — such as generic domains. Hreflang also permits marketers who choose to invest less in molding and personalizing their site to their customers to do so without harming their SEO efforts. For instance, you can deploy generic Spanish content across 20+ countries, which means you may save money on translation or development costs. But what’s the cost of lower conversion rates? Where is that taken into account? No, for once this is not my British irony shining through. I wanted to make absolutely clear that I understand why Google launched hreflang, and that it’s very welcome, because it does provide a wise option for marketers. It’s just that webmasters shouldn’t blindly deploy something simply because it exists — rather, they should carefully consider which option is best overall. This week, Maile Ohye of Google will once more join us (along with other great speakers from Microsoft, Getty Images, Rosetta, Yandex, and Logitech) at the International Search Summit on the Thursday immediately after SMX Advanced. I have no doubt that the subject of hreflang will come up once again, and Maile will be able to help webmasters develop their understanding of geo-targeting and the role that hreflang plays in an enlightening way!